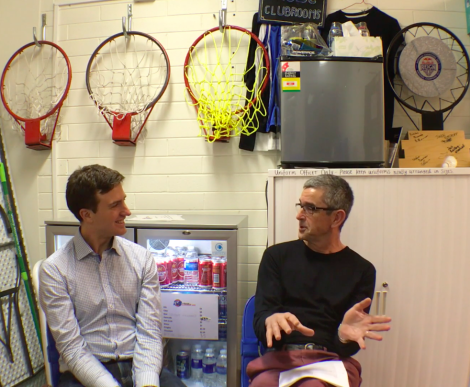 The heart and soul of Melbourne Uni Basketball throughout the 80's, John 'JC' Campbell visits the clubrooms to chat about his time at the club. Active player for 26 years, from 1976 through 1991 inclusive. Played a total of around 2,000 games. Played firsts (VBA division 1&2), seconds (VBA division 3) and Sunday nights A Grade, and Inter-varsity and around 80 tournaments. Coached men’s teams in domestic completion and tournaments, and women’s teams including the firsts and at tournamnets. Committee member as Assistant Secretary (2 years from 1977) then Secretary for 8 years. Full Blue 1982, 84, 85, 86, 87 and 88. MUBC IV MVP 1982, 83, 84, 85, 86 and 90. Joined MUBC at the O week table, then attended Welcome “Wine & Cheese” in Barry Humphries Room Arts South Building. Other notables to commence in 1976 include Graeme Clarke, Andrew Bett, Graeme Bennie, Simon Brown-Greaves, Jan Landgon, Barb Robertson and Ann Compton. I.V. team member in Hobart, debuting with Andrew Bett. Les Walker, Chris Macpherson and Skippy were the stars. Finished 7th, beating Monash in the playoff). The occasional game in the men’s firsts with players like Ray Watson, Mike Means (USA), Neil (Simple) Simms and Chris Macpherson. Began as editor of Dribbling Balls... at that time it was created by cutting a stencil using a typewriter, then given to the Sports Centre to be roneo-ed. Attended Sale Portland (the First South West Classic) and Swan Hill tournaments – my first adventures in the club tent. Played at Wollongong I.V. – Ray Watson, Les Walker and Skippy were the stars. Finished 8th, beaten by Monash. Ray Watson in the All Aust team. Playing firsts (VBA Div 2). Coaching women’s team... VWBA Div 2... featuring Bridget Grounds, Jean Prior, Terry Canale, Annette Schepisi, Jenny Hampson... and Gillian Payne making her debut in April 1983. Women won A Grade at Ballarat... Bridget Grounds (Tournament MVP), Jean Prior, Terry Canale, Bernadette Burke and Carmel Cadzow led the way. Coached the women to win A grade at Portland (Bridget Grounds GF MVP, Annette Schepisi, Jean Prior, Woody Macpherson, Julie Walker, Gillian Payne, Bernadette Burke)... Preceded by an eventful party at Macs Hotel... then spirited debate in Dribbling Balls. South Pacific Universities Championships in Fiji... lost 81-74 to UQ in final. Graeme Jane, Dave Davies, Simon Brown-Greaves and JC All Star team. Played at Melbourne (Swan Hill) I.V. ... now called AUC... Finished 5th blowing a couple of games to miss quarter finals on percentage / Coached women at IV – Winning! Beat UWA 54-47 led by Bridget (GF MVP), Spike, Tracy Nero, Kylie O’Brien, Gillian, Deb Kool, Anne Cantwell. Anne and Spike All-Australian. JC first All-Australian. Swan Hill recovery function... pyramid races at the Turf Club then a paddle steamer cruise. Chris and Woody Macpherson, Matt Wellington, Bowlesy, Mal Short and Trevor Smith did huge amount of organising. Played at UQ (Brisbane) I.V. ... now called AUC... Finished 2nd ... led by Andrew Parkinson, John Swartz, Hugh Sandie, Matt Miller. Swartz and JC All-Australian. Played at Adelaide I.V. ... now called AUC... Finished 2nd 79-74... the one that got away... led by Andrew Parkinson, John Swartz, Hugh Sandie, Matt Miller. Parky Tournament MVP, Parky and JC All-Australian. Donna Watt All-Australian. Played at Sydney Uni I.V. (Port Macquarie) ... now called AUC... Finished 6th ... led by John Swartz, Mark Sheehan, Dimitri Taylor and Tim Morphy. John Swartz All-Australian. Women won... Sam MCLeod, Donna Watt, Narelle Frohling and Jo Storer All-Australian. Sponsored by Dentons... the only company you need in bed! No IV due to pilot strike. © Melbourne University Basketball Club 2019. This page was last updated by smoke on August 31st, 2016.